Relief is calculated with the instrument tuned to pitch. We can measure relief using a straightedge, or simply by using one of the strings as our straightedge. After fretting the E string at the 1st and last fret, the gap can be measured. With the string touching the first and last fret on the neck when can compare the straightness of the string (or straightedge) with the curvature of the neck. Measuring the distance between the bottom of our string and the top of the 7th fret we can determine how much bow (relief) is in the neck. Notice the first neck is slightly bowed ...this is known as neck relief. Tightening the truss would result in a flatter/straighter neck. The truss rod nut is located either on the peghead (covered by a small plate) or at the heel end of the neck. Some bolt on necks require removal for access. The truss rod helps to counteract the strings pull on the neck. When string tension is placed on an instruments neck, the neck will naturally want to bow forward under tension. When too much neck relief is present tightening the truss rod will help to counteract the pull of the strings and straighten the neck. When the neck is too flat to play cleanly, or has begun to backbow, loosening the truss rod will reduce the backwards tension on the neck and enable the strings to pull the neck forward, creating more relief. How far do I turn the truss rod? The amount will vary according to the amount of adjustment needed, the necks density and the type of rod. Regardless, adjustments should always be made in very small increments, 1/4 of a turn would be allot of adjustment for many instruments. Start small! The number one reason people won't touch the truss rod is that they are afraid of making a mistake and damaging it. It's a healthy fear actually but one you can overcome with understanding. Numerous instruments have come to me with rounded threads when the appropriate socket or allen wrench was not used, this is easily avoidable. If in doubt, check the manufacturers website for specs. If a truss rod is already as tight as it can go, starting an adjustment by tightening the nut first could end in a horrifying pop. If one starts by loosening the nut slightly they can quickly get a feel for how much tension is already on the rod. Starch resistance and creaking sounds can be a sign that the truss rod should not be adjusted further and is more than enough reason to stop and seek help. A truss rod that has reached the limit of it's ability to straighten the neck can begin compressing the wood behind the nut, not only is this unproductive, it is responsible for many stripped nuts and broken rods. If I really feel as though ideal relief is just out of reach I will often remove string tension, clamp the neck flat or slightly back bowed and tighten the nut. This removes some of the resistance on the nut and may help achieve greater adjustment. It would be helpful to simply use a set of numbers to adjust truss rods, however, there are too many variables to make setting up an instrument simply by numbers the best way to go. Since that's the case I believe it's better to explain why we are adjusting relief and give some guidelines where measurements are concerned. String gauge, playing style and the instruments neck stiffness (or lack thereof) can all play a part in adjusting relief properly. In my opinion, the straightest you can adjust the neck without creating an obnoxious amount of buzzing is always the target. The straighter the neck, the faster the feel and the less we interfere with intonation. Light pickers, speed metal and jazz musicians often fall into the group that can play a very straight neck. When the instrument allows for it we target the .004/.006 range. Hard strummers, extra light gauge strings and fingerboards with a smaller/rounder radius often require a bit more, say .008-.012. It is important that players desiring a dead flat neck be fully aware of the maintenance often required to keep the neck flat. Moisture and temperature changes can quickly cause a flat neck to become a slightly back bowed neck that buzzes in nearly every position. Having a small amount of relief gives the neck some room to move before those changes have such a great impact on tone, it's a bit of elbow room you might say. The amount a neck will change is as unique to that instrument as the wood used to make it. I have guitars that never budge and others that I literally leave the truss rod cover off so I can adjust on the fly. Neck movement can also account for the differences we hear from one day to the next when seasons are changing. Those who travel frequently with their instrument or subject it to different environments should realize truss rod adjustments can be required as a result. When a neck is adjusted dead flat, humidity changes may cause it to backbow slightly. This can be aggravating for those who have no desire to repeatedly adjust their truss rod. Very light gauge strings have a tendency to vibrate in a wider pattern than those under more tension, as a result we need to give them slightly more relief to reduce buzzing. Hard strumming can also demand a bit more relief, though higher action at the saddle may be a better choice. Dual action, or two way, truss rods can add relief as well as straighten a neck. When turned counter clock wise the rod bends forward creating forward bow (relief) to the neck. 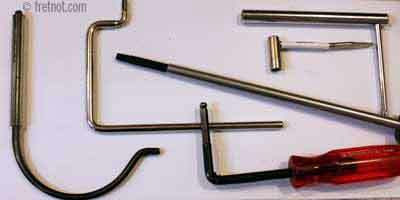 These rods have small hex nuts that are welded to the end of the rod and unlike a tradition rod, the nut can not be removed. Double truss rods are commonly found on 12 string guitars and basses as they provide additional strength and rigidity. They are two individual truss rods laid side by side in the neck. Adjusting double truss rods is similar to adjusting a single rod with the except that you must adjust them both correctly to provide identical relief on both sides of the neck. These are still the most common type of truss rod. As a single action truss rod is tightened it compressing the neck causing it to bow. 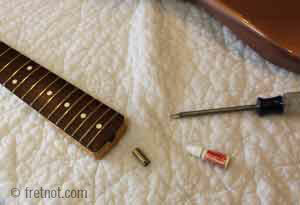 As the truss rod nut is loosened, tension is removed, allowing the strings to "pull" relief into the neck. Having a truss rod nut at the heel often requires neck removal or loosening. In order to ease the pain of adjustment, Gotoh created a side mount adjuster which permitted small adjustments to be made at the side of the neck. In most cases, this is a biggy. Players may hear a clicking sound when attempting to tighten these rods, others may spin freely. 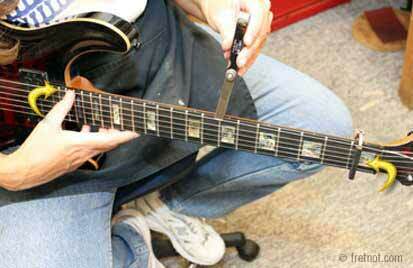 Removing most truss rods requires removal of the fingerboard, which in turn, requires a refret and finish work. When available and appropriate, bolt on necks (ex: Fender Strat) can be purchased for less than the cost of truss rod replacement. Even some newer acoustic guitar necks can be replaced for only slightly more than the cost of removing a fingerboard, replacing a truss rod, rebinding, refretting and refinishing a neck. My truss rod is as tight as it will go and the neck still has way too much relief in it. A maxed out truss rod is quite a dilemma. When these can be repaired, fingerboard planeing and refretting with large tang fret wire is used to straighten the neck. If, however, the neck shows itself to be weak and spongy, satisfactory results may not be obtainable using that method. This is a situation that requires physical examination to determine the best course of action. Some nuts have been stripped by using the wrong wrench, others by over tightening. When the truss rod nut is not welded on (like two way truss rods), the nut is backed out and replaced. When adjusting truss rods on vintage or problematic guitars I prefer to lubricate the threads with graphite to help prevent thread seizure in the future.